Following the debut of the Viziv Performance Concept at the 2017 Tokyo Motor Show, Subaru confirms reception has been positive. Read more about Subaru Claims its Next WRX Will Actually Follow the Concept at AutoGuide.com. For my tastes it looks too high-tech. While it's cool for a concept to show off what it can do, all I see are dings on the boxy edges that are impossible to pull out with PDR from soccer moms and their young at the supermarket. bheinen74 and thelabradog like this. That headline sounds like something from The Onion, honestly. Besides, it's Subaru. The car won't look half as good as the concept. 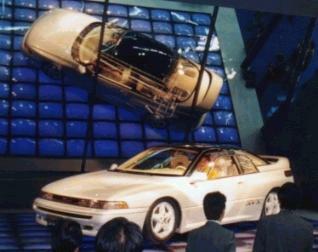 If they took a SVX to one of these concept shows and parked it next to the future concepts, more people would be studiying the SVX. wondering what it is still after all those years. 1 Lucky Texan, rasterman, johnre and 1 others like this. And what else can he say if that question had been thrown to him by the AutoGuide.com reporter? "No, it won't at all resemble the concept you see here."